In any organization, work often needs to be formally approved before it can begin. Budgets, creative projects, marketing initiatives, invoices, and many other work items all move through a series of approvals before they are considered either ready for kickoff or complete. Many organizations create specific approval processes or workflows that dictate how work should be approved (or rejected) every time to save time and ensure standardization. In this article, we’ll provide everything you need to know about approval processes and workflows: what they are, the elements to include, and the underlying logic you’ll use to design the sequencing. Then, we’ll discuss the rise of automated approval processes, and offer advice on what to look for in a software program that supports building these workflows. Finally, we’ll show you how to create an approval process for a variety of different industry needs including content, invoice submission, and purchase order approvals, as well as college admission and FDA drug approval. An approval process is the method an organization uses to approve anything from documents, invoices, budgets, and purchase orders, to a new process that a company wants to institute. Implementing an approval process can standardize an organization’s internal processes, and also save time by creating a dependable, repeatable system. Approval processes are a type of workflow, which is any sequence of work from initiation to completion, that you can create to ensure work is approved the same way every time. Creating an approval process can simply mean defining the procedures that you will follow to approve work. You can choose to create a manual approval process where employees follow specified steps and have a manual record of completion, or no record at all. Manual approval processes can be extremely tedious and time-consuming, which can lead to delayed delivery of goods, missed payments, poor document management, and a non-uniform approval process. Additionally, manual processes tend to be less transparent, so some employees might not be aware of the processes and therefore less compliant. As a result, many organizations have transitioned to automated approval processes and workflows. Companies can use software to create a tailored approval process, which then guides users through that process to ensure work is completed and approved the same way every time. The main benefits of automated approval processes include saving time, maximizing efficiency, and standardizing processes. Additionally, automated approval processes improve transparency and compliance within an organization, since everyone is forced to complete work according to predefined criteria. They also improve decision making, such as whether or not to adopt a project, because the process you define will help you more clearly identify costs and benefits of any work proposal. However, some people struggle with the lack of flexibility that hard-coded automation can inflict upon processes. Submission: An approval process usually begins with someone submitting something (a document, invoice, purchase order, etc.). You’ll need to create a submission portal where users go to submit their work. Think about including a submission receipt option, so submitters have a record of their activity. Assign Approvers: The approval process hinges on someone else (not the submitter) approving the work, so you’ll need to identify the person or people who have the final say. If your process has multiple approval levels, define who will approve which aspects of work at each level. Set Permission Levels: Define the level of authority each user should have. Most systems have features to delineate among viewer, editor, and administrator permissions, so you can control who edits, rejects, or approves submissions. Set Due Dates: As with any project, it’s important to set deadlines to keep your workflows moving and prevent work backlogs. Automatic Alerts and Notifications: A program that automatically sends alerts and notifications about the status of a submission can help expedite workflow. Automatic alerts may be approval or rejection notifications, update requests (where the approver requests that the submitter makes changes to the original submission), or a simple status update alerting users that work is advancing to the next step in the process. Submissions may have to go through multiple rounds of edits before they are approved, so automatic alerts and notifications can ensure that items are accomplished quickly and that everyone is aware of the current status. View User History: See who has made changes, to what, and when. Lock Record: This will make the record uneditable, so that no user can change the log of actions. Edit Record: In some cases, you might want the record to be kept editable - for instance, if you made a mistake or need to keep certain information private from other parties. Email Templates: Some platforms have built-in email templates for notifications. This functionality adds a personalized touch and also provides a space for enhanced communication. Edit Requests: Similar to update requests, edit requests specifically notify a submitter when the submission has been (temporarily) rejected and that it requires changes before it can be approved. Task Lists: It can be helpful to build task assignment into the approval process, allowing each employee to clearly see their responsibilities, and informing management of resource allocation. Many of these elements will be present in the approval process you design, regardless of the specific project or type or organization. In the next section, we’ll discuss the software programs that allow you to build approval processes and workflows, and additional features to consider. Create Discrete Steps: An approval process is only effective if there are clear, defined, and repeatable steps. Choose a program that allows you to write discrete steps that users can easily follow and repeat an infinite number of times. Templates and/or Built-In Workflows: Pre-built templates are helpful if you’ll be creating multiple workflows for a variety of specific use cases. This way, you won’t have to start from scratch every time, or hard-code any parameters. Customization: Although built-in workflows can help you get started, you may want to retain some flexibility. Choose a program with customization options so you can tailor your process; if it doesn’t fit your needs, there’s no benefit. Edit Capabilities: Once you build your workflow and start using it, you might need to make changes to the procedures you initially put in place. Systems that allow editing will save of time. Mobile Features: Solutions that offer mobile capabilities enable your team to submit work, receive notifications, make requests, and approve work from their phone or tablet. Signature Collection: If you’re approving sensitive or highly important documents and information, you may require a signature. Some programs offer signature collection so that you can verify approvals. Feedback Collection: Perhaps you want to create a workflow that elicits feedback, rather than approves work. In this case, look for a program with qualitative collection capabilities. This might be a template option within a larger system (as in Sharepoint, for example). Notification Templates: You might also want to send notifications in a specific way, such as an in-app notification, email, or push notification on another device. If you want to control the way a user receives notifications, choose a platform with this function. To create an approval process, first map out all the steps. You can think of approval processes as a series of pathways and positive feedback loops. There are often only two possible end-points: reject or approve the submission. However, there are multiple steps and pathways that occur before reaching a conclusion. How should requests be submitted? Decide how submitters should submit their work, including when, how/where (for example, an online form or portal), to whom, and what to include in the initial proposal. What documentation should you include? Decide if any supporting documentation must be part of the original submission, or if editors and approvers need to send documentation along with their approval or rejection. If so, make sure the software platform can support document storage. How many steps are there, and what are they? The decisions made at this point are the meat of your design process. Here you create the pathways from initial submission to final approval or rejection. For each stage, define the criteria that must be met for a submission to move to the next stage. Who approves each step? Identify approvers for each stage of the approval process. Who should edit submissions, and at which steps? 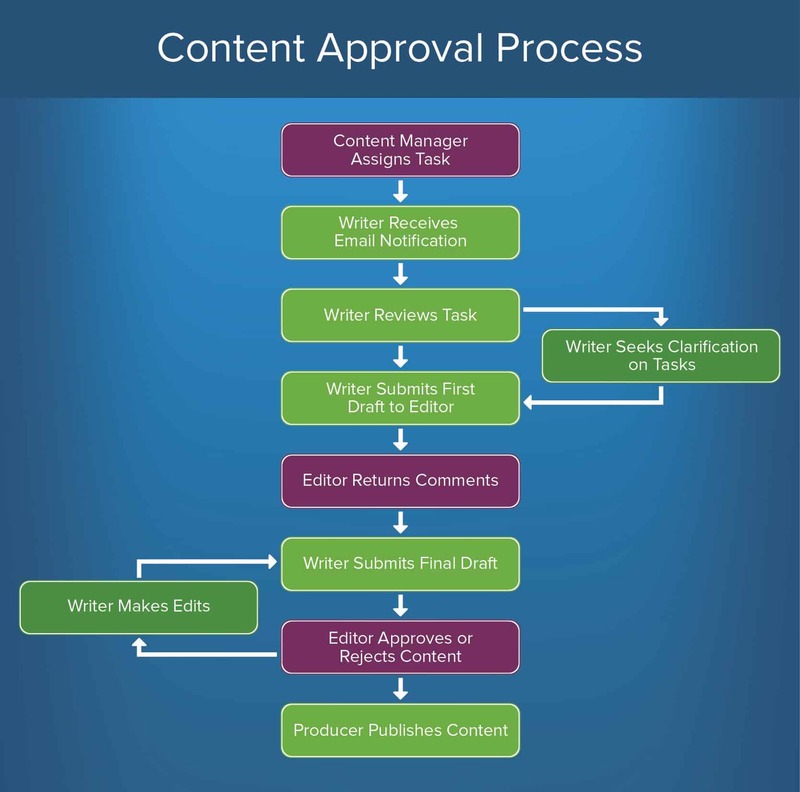 If your process requires edits at certain stages, who will edit the submission (for example, it could be the original submitter, a designated editor, or the approver)? Deciding who is responsible for editing may change your sequencing. Under what criteria should requests be automatically approved or rejected? There might be instances where an automatic approval or rejection is permissible. Be sure to define these parameters in your logic so you can apply it to the program when you build your process. What actions happen when a request is approved or rejected? Your approval process should not exist in a silo, so consider how it is connected to the execution processes, once a submission is approved or rejected. Consider linking notifications to kick off a project or pull the next submission. Approval processes can benefit organizations of any type or size, across all industries. You can create an approval process for any repeatable system that can be broken down into discrete steps to formally approve a submitted piece of work. Some of the most common types of approval processes include invoice submissions, documents and creative assets, purchase orders, projected budgets, project plans, college applications and admission, or Food and Drug Administration (FDA) drug approval. Below we show you the essential aspects of each of these approval processes, and how to design the process itself. While the specific steps you take to build an approval process will vary based on the system you choose to build it in, these logic maps will help you define the workflow that works best for the situation and your specific requirements. Content approvals are ubiquitous across all industries and types of organizations. They include any creative asset, written work such as an article or social media copy, or any other documentation that needs approval prior to publication. Content Manager Assigns Tasks: The editor creates a schedule of tasks and assigns specific work items to each content producer (in this example, a writer). Writer Receives Email Notification: Institute a standardized way to notify writers of their tasks. Email notifications are easy to use and provide a record of assignment. Writer Reviews Tasks: The writer reviews the assignment and, if necessary, seeks clarification on tasks from the editor. Writer Submits First Draft to Editor: This is the initial submission step where the writer submits the first draft of their work for editor reviews. Editor Returns Comments: In most content approval processes, there will be at least one round of edits. So, build in a step where the editor makes edits and returns the submission to the writer to make additional changes if needed. Writer Submits Final Draft: Once the the necessary edits are made, they return the content to the editor for a second review. Editor Approves or Rejects Content: Here the editor has the option to either approve or reject the content. Approve: The content is formally approved. Reject: The writer must make more edits. This cycle of edits can continue until the editor is satisfied and the content is officially approved. Producer Publishes Content: Once all edits are finalized, the content is published. Invoice submission is another common practice that a standardized approval process can improve. On a monthly basis, you might receive invoices from vendors, contractors, or even internal employees seeking reimbursement, so creating a repeatable, reliable approval process will help ensure that everyone is correctly paid on time. Vendor Mails or Submits Invoice Through an Online Portal to Accounts Payable: The vendor submits their invoice to the correct department or single approver (typically accounting or accounts payable). If using an online portal, the invoice is automatically routed to the correct person or department. Invoice Meets Requirements: The invoice can move on to the next stage in the approval process. Invoice Does Not Meet Requirements: The invoice is returned to the vendor, who will update and resubmit the invoice. 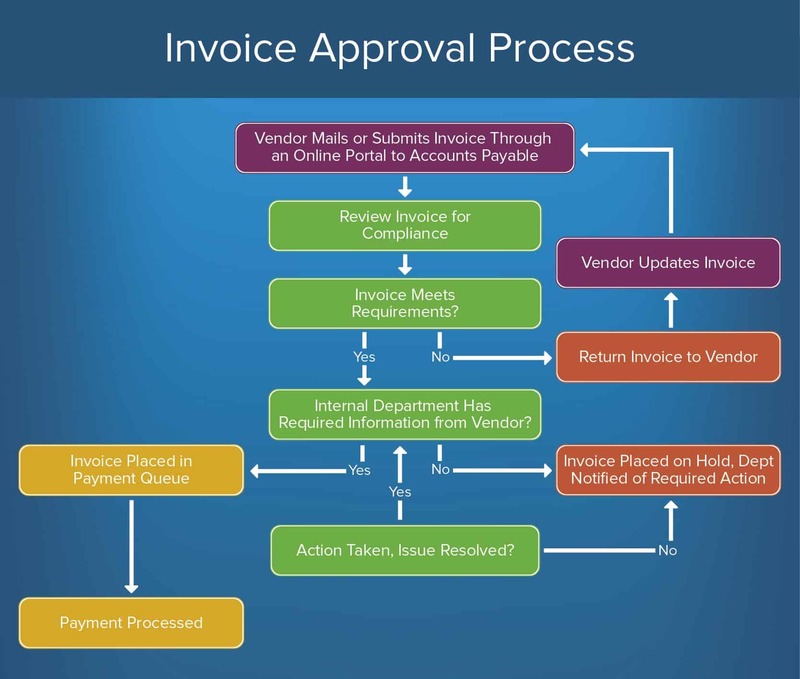 Internal Department Has Required Information from Vendor: In order for an invoice to be processed and payment sent, the approving body often must include supporting information or documentation about how and why they approved the invoice. So, build a step into your process to verify that the required support documentation is included. Support Material Included: The invoice is placed in the payment queue, processed, and sent to the submitter. Support Material Not Included: The invoice is placed on hold until the approving body compiles all necessary documentation. Once this happens, the invoice returns to the final review stage and if approved, is placed in the payment queue and then processed. A purchase order (PO) is a document sent from a buyer to a seller to request a certain amount of goods or services at an agreed upon price. 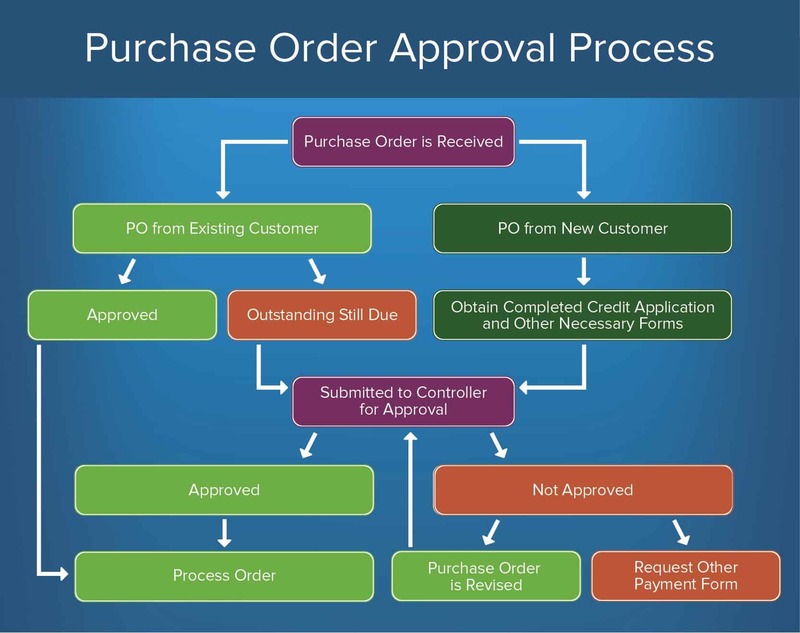 Creating an approval process for purchase orders can help you monitor the pace of incoming requests, manage inventory and resources, and provide a log of your external business. Approved: If everything is correct and the customer has no outstanding balance, the PO is approved and the order is processed. Outstanding Still Due: If the customer has an outstanding balance, it is sent to another party for review and approval (Step 2 below). PO from New Customer: The new customer may have to complete a credit application to ensure that they are equipped to pay for the goods or services requested in the PO. Submitted to Controller for Approval: The approving body reviews the PO and any supporting documents (credit application, payment history, etc.) and either approves or rejects the PO. Approved: The purchase order has been approved and the order is processed. Not Approved: The purchase order has failed to meet requirements and is rejected. The buyer will sometimes request another payment form, or the seller might revise the PO and resubmit it to the controller for approval. Most companies have to propose an annual or quarterly budget before they can formally adopt projects and allocate funds. 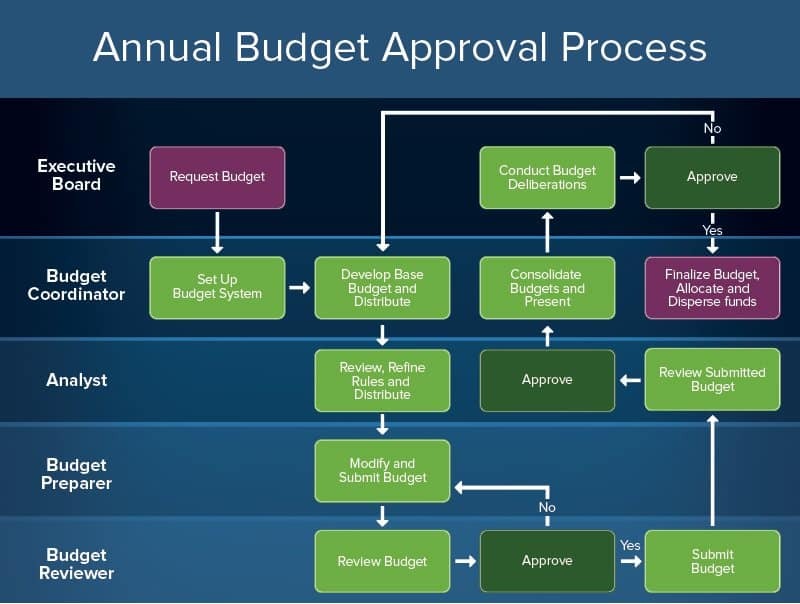 Since most - if not all - of an organization’s operations depend on having a pre-approved budget, it’s essential to have an approval process in place. Request Budget: The executive board submits their proposed budget. Set Up Budget System: If you don’t already have a system in place to manage and allocate budget, you can build this into your approval process. Complete this step early, as it will inform the rest of your budget review and fund allocation process. Develop Base Budget and Distribute: The budget coordinator defines the base annual budget from which you will measure the proposed budgetary needs. Review, Refine Rules, and Distribute: This is the initial review, usually performed by an analyst. Modify and Submit Budget: Internal budget preparers modify the proposed budget based on the reviewer’s (analyst’s) feedback and resubmits it. In some cases, the original submitter (in this case, the executive board) can also be responsible for modifying and resubmitting the budget. Review Budget: A designated budget reviewer now reviews the most recent draft of the budget. Approved: If approved, the budget reviewer submits the final version of the budget back to the analyst for another round of reviews. Rejected: The budget goes back to the budget preparer for another round of edits, and is then resubmitted to the budget reviewer. This process may require multiple attempts before the budget is approved. Review Submitted Budget: The analyst performs another review on the submitted budget, which has now been approved by the budget reviewer. Consolidate Budgets and Present: Now that the budget has been approved by all analyst and review levels, the budget coordinator compiles the information and presents it to the executive board for final sign off. Conduct Budget Deliberations: The executive board reviews the changes made by the approving bodies, and either approves or rejects the budget. Approved: The budget is now officially approved and is adopted into the organization’s yearly planning. Funds are allocated. Rejected: The executive board resubmits their proposed budget (perhaps with modifications) to the budget coordinator; the cycle begins again at Step 3. 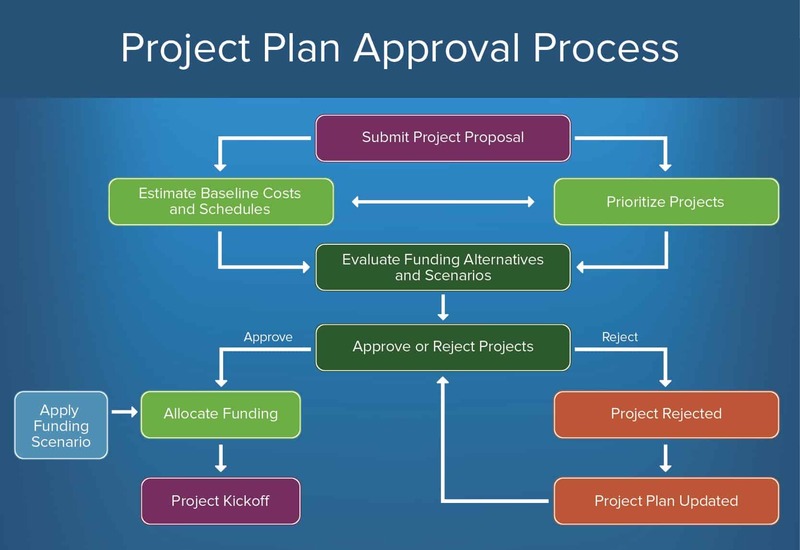 Every project that an organization adopts must first pass through a series of approvals. With so many competing projects, budgets, and departments, an approval process helps organize and prioritize projects. Submit Project Proposal: This is the initial submission, where teams define and request the project they want to take on. You can find a project plan template here. Estimate Baseline Costs and Schedules and Prioritize Projects: In these phases, draft a budget and timeline based on your project proposal, and roughly prioritize projects. There may be some back and forth between these two steps before advancing to the next step. Evaluate Funding Alternatives and Scenarios: It’s important to consider alternatives - both to your project specifications and budget - in the event that your proposal is rejected. Build in a step to draft other options, or aspects of your initial plan. Approve or Reject Projects: The proposal is reviewed by the approving body and either approved or rejected. Approved: If approved, funding is allocated for your project and you can hold a project kickoff. Rejected: If rejected, the proposal is terminated. However, you can also build a step for submitters to revise the project plan and resubmit for approval. 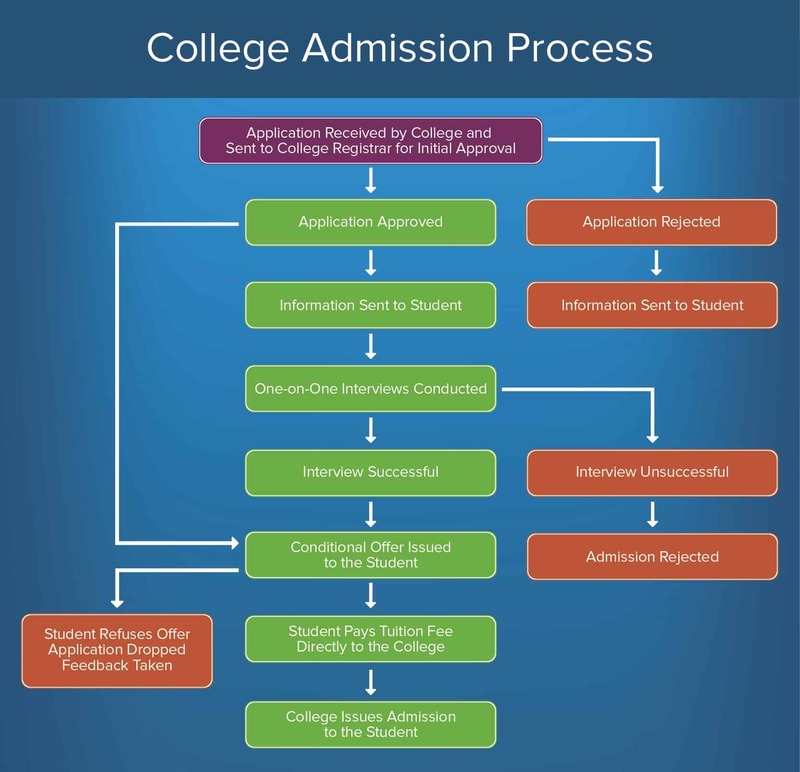 Colleges and universities receive a high volume of applicants and as such, must create an automated, consistent approval process for admitting and enrolling students. While the steps listed below are what academic institutions might follow, you can also edit the process outline for admission to other programs. College Application Received and Routed to College Registrar for Initial Approval: The application is submitted (typically through a portal such as the Common App or a university website). The registrar, or any other administrative approving body, performs an initial screening and either approves or rejects the application. Approved: The application passes the initial screening and next-step information is sent to the student applying. Rejected: The student’s application is terminated and information is sent to the applicant. Conduct One-on-One Interviews: Many academic institutions require interviews as part of the application process. However, some don’t, so this step is optional. Interview Successful: If the interview is successful, the college or university issues a conditional offer to the applicant and moves onto the next stage. Interview Unsuccessful: The student’s application is rejected. Conditional Offer Issued to the Student: The university formally offers the applicant admission. The student can accept or refuse the offer. Students Accepts Offer: Student accepts the conditions of the university’s offer and pays tuition to the school. Student Refuses Offer: The application is dropped. At this point, the university might also solicit feedback from the applicant to use for future application cycles. College Issues Admission to the Student: Once the college receives the tuition, the student is enrolled in the university. Every pharmaceutical drug on the market today in the U.S. has to pass through a lengthy approval process, as enforced by the Food and Drug Administration (FDA). The following outline is taken directly from the FDA's website. Stage One: Pre-Clinical: In this stage, the person or body sponsoring the drug (drug sponsor) discovers and screens the drug. Drug Developed and Animals Tested: Once the sponsor has developed a new drug and wants to have it approved by the FDA, they perform animal testing to gain information on the safety and efficacy of the drug compound. Investigational New Drug (IND) Application: The drug sponsor submits an IND application to the FDA to seek approval. This application includes information on the results of the animal tests, as well as on the composition and manufacturing of the drug. Stage Two: Clinical: This stage consists of the drug sponsor’s clinical studies and trials of the proposed drug. Phase 1 (20-80 volunteers): This testing phase is primarily concerned with identifying the most common side effects, and how the drug is processed within the human body. It emphasizes safety. Phase 2 (hundreds of volunteers): This phase emphasizes effectiveness, and tests how the drug affects a certain disease or illness. Phase 3 (thousands of volunteers): In this phase, testers gather more information about both the safety and effectiveness of the proposed drug. They also test it in combination with other drugs, different dosages, and different populations to understand the effects. 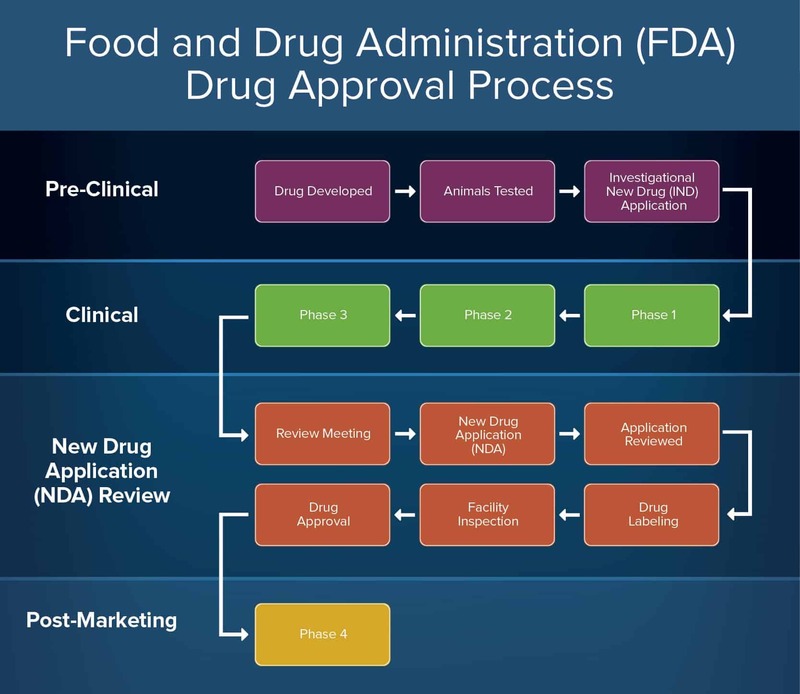 Stage Three: New Drug Application (NDA) Review: The FDA performs a comprehensive review on the new drug to ensure it meets requirements and is safe to approve. Review Meeting: The FDA meets with the drug sponsor to discuss the findings of the testing. NDA Application: The sponsor submits a formal application, and includes all data from the tests they’ve completed on both animals and humans. Application Review: The FDA has 60 days to review the NDA application and decide whether or not to file it. Filed: If the FDA files the NDA, it moves on to the next review step. Not Filed: The FDA can also choose not to file the NDA. At this point, the drug proposal is terminated. Application Reviewed: If the FDA decides to file the NDA, they perform a review of the application to evaluate the sponsor’s research and the drug itself. Approved: If approved, the drug moves on to the next step. Rejected: If rejected, the proposal is terminated. Drug Labeling: The FDA reviews the official drug labelling and edits it to ensure the proper messaging and communication to health care professionals and consumers. Facility Inspection: The FDA performs an inspection of the facilities where the drug will be manufactured to ensure safety. FDA Drug Approval: The drug is formally approved by the FDA. Stage Four: Post-Marketing: Ongoing efforts by healthcare industries to appropriately market the drug to the public. Regardless of the type of approval process you create, you’ll want to build it in a reliable, automated platform that seamlessly connects to your other business processes and tools and provides easy collaboration. One such tool is Smartsheet, the world’s leading SaaS platform for managing and automating collaborative work. Smartsheet is designed to increase work agility and collaboration by providing a powerful platform for organizations to plan, track, automate, and report on work. You can build automated approval processes without a single line of code, complex formulas, or help from IT. Achieve faster progress by creating automated approval requests and automated update requests that are triggered based on preset rules. Use Smartsheet to automate and streamline the following approval processes: time card tracking, sales discounts, procurement, HR hiring, content, and more. Plus, Smartsheet integrates with the tools you already use, to seamlessly connect your efforts across applications.